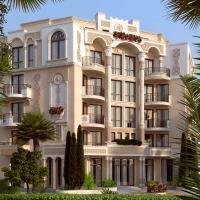 The complex is located in the central part of Sunny Beach in a quiet and cozy area. Extremely suitable for a year-round use thanks to its proximity to a number of restaurants, shops, banks, etc. 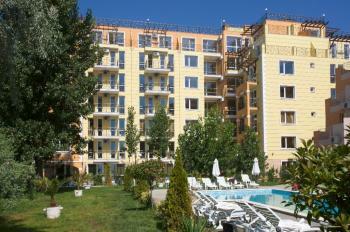 The complex is very close to the biggest Aquapark in Bulgaria and the beach is only 8-9 min. walk away. The complex has 94 apartments - studios, one-bedroom apartments, two-bedroom apartments, all with designer furniture and finished down to the smallest detail. Each apartment has been approached individually and the result is a unique atmosphere and a maximum functionality of the interior. In addition to this, at your disposal are a reception with a lobby, private carpark, swimming pool for children and adults, and a balcony garden with sun beds on the roof. For your wellness and good health, there is a gym, and if your want to fight the stress and relax, you can use the SPA center. The complex is up to all recent standards, under our strict supervision and materials of highest quality. Location: Quiet and cozy area in the very heart of Sunny Beach surrounded by lots of greenery. Structure: Reinforced structure according Bulgarian Government Standard. Outside walls: Wienerberger Porotherm, Austria bricks, produced in Bulgaria, thermo-insulation 5 cm, outside plaster and natural stone Travertine. Interior walls: Ytong gas concrete blocks, produced in Bulgaria, plaster, gypsum plaster with PVC mash, latex. No drywalls! Lift: Electrical lift, capacity 600 kg (8 persons, speed: 1m/sec, produced by the biggest lift company in Bulgaria IZAMET). Bathrooms: Spanish fiancé and terracotta tiles, hydro-insulation, shower cabin - new model, no shower base (or a hydro massage bath tub). Mixers and sanitary ware produced by Fayance, Bulgaria, owned by ROCCA Group - Spain. Apartment flooring: Laminated floor EGGER, Germany - class AC3/31, thickness 7 mm. Furnishing: Completely furnished down to smallest detail. Functional designer furniture, decoration of natural stone on the walls, hidden LED lightning, designer elements, combinations of artificial and natural flowers, fancy wallpapers and murals. Air-conditioners: Midea, class A for heating and cooling, 5 years guarantee from the manufacturer. Doors: Produced in Bulgaria - solid frame, golden oak cover to match the furnishing, lock and cylinder - produced by Metal, Bulgaria. Window frames: 6-chamber PVC framing KMG, produced in Bulgaria, using German equipment and a German license. Adjustable hardware, double opening of the doors, double glazing, 24 mm. Balconies: Spanish granitogres, hydro-insulation, designer railings of wrought iron, galvanized against rust. Roof: Watertight concrete, 5 cm hydroinsulation Fibran, 2 layers of hydroinsulation produced by General Membrane Spa - Italy. French roof drain pipes produced by Nicoll. Fire safety system: Complete fire safety system in each apartment and the common parts of the complex, audible alarm. Fire hydrant and fire extinguishers on each floor. Smoke hatch on the roof. Partition doors for each corridor. Common parts: Fully completed, Spanish granitogres floor tiles, walls and ceilings - gypsum plaster and latex painted, lighting. Reception: Natural stone Travertine on the floor, top class finish with RGB LED lightning, natural bamboo wallpapers and natural stone Travertine. SPA area: Completely finished. Designer work. Natural materials. Professional technical equipment by leading companies in this field. Finnish sauna with a Nordic Pine lining (dry room, t100°С), steam bath (wet room, high steam content, t40 °С), ice-cold water jet (cold room, ice for rubbing the body), relax area with a heated sofa and a foot bath, massage area, Jacuzzi area, shower and a shock bucket. Garden: Fully fenced, automated access control, stamped concrete, private car park, greenery. Swimming pool: Adult swimming pool, size 21m/6m, children pool size 2m/3m, water effects: waterfall.